Another Australian swap book arrived from Phil of OrtBindery. 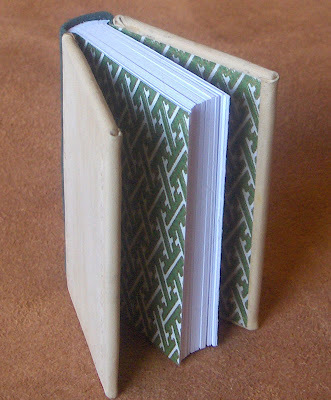 The structure used to make this little book is called a three-piece binding. The side boards are un-dyed calfskin leather with delicate blind tooling along each side. The tool is from J-B Alivon in Paris. 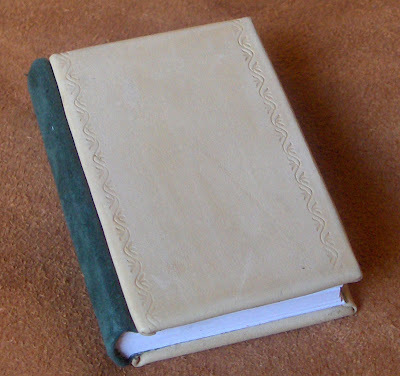 There is dark green suede on the spine with coordinating green and gold Japanese paper used inside for the endpapers. Visit OrtBindery.Etsy.com to see more of Phil's work. gorgeous! the tooling is so pretty! That is an amazing book! This is beautiful! Did you do the tooling after the leather was on the boards? Seems like you'd have to so that it would line up properly. Either way, it's lovely.